For the Austrian Darts Open a player qualified by the UK Qualifier who a few years ago regularly played on the PDC Circuit and whose trademarks are his raised shirt collars. Gray was born in Hastings/Sussex in 1981 and started to play darts when he was 18. He soon was considered as a big talent whom a glorious future was predicted. 2003 he for the first time played in a televised tournament - the UK Open. 2006 he for the first time managed to qualify for the PDC World Championship. But "his tournament" always was the UK Open and at his till now last appearance in the event 2013 he reached the fourth round. Gray never really made an impact on the PDC Pro Tour but he from time to time caused an upset. In 2007 he qualified for the World Matchplay and for the World Grand Prix. His appearance in the World Grand Prix made the head-lines - he defeated first round no other than Phil "The Power" Taylor. Gray never was able to repeat this success and he was eliminated both in the World Championship 2008 as in 2009 first round. 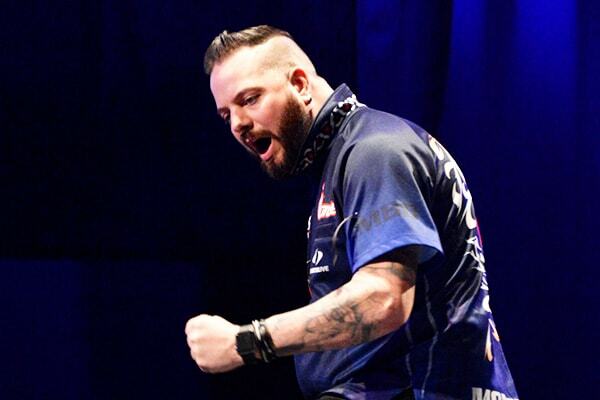 His defeat against Paul Nicholson is memorable - Gray lost 3:0 without winning a single leg and he had only one dart at the doubles.As he was fast sliding down the rankings he had to take part in Qualifying School 2012 and won himself a tour card which he lost gain end of 2013. For some years Gray mostly played soft-darts and was the only English player who took part consistently in the Dartslive tournaments. He was quite successful and won two of the events. End 2016 he was ranked fourth. 2017 he took part in Super Darts and reached the semi-finals. But it looks he intends to find a way back into steel-darts and the PDC - he took part in Q-School 2017 but didn't manage to win a Tour Card. But as an Associate member he can take part in the European Tour Qualifiers and now managed to be in the field of participants for the Austrian Darts Open. Might be we'll see him more often now. Gray never was and still not is a professional darts player but earns his living as a carpet fitter. Together with his partner Barnes in 2006 he was East Sussex carpet fitter of the year. Before the PDC World Championship 2009 a calendar with Adrian Gray pictures came on the market - encouraged by his family and his friends. Gray at least at that time set great value upon his looks which clearly set him apart from his often rather heavy-weight colleagues.